Johnny and Matt’s Festive Walk. This is now a well established and most welcome Christmas tradition. 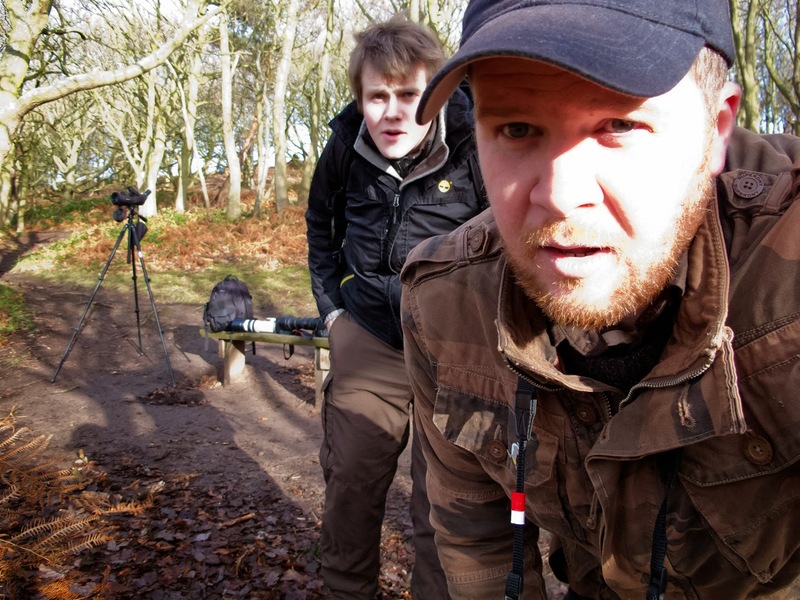 We just grab our cameras, some munchies and hit the Patch. 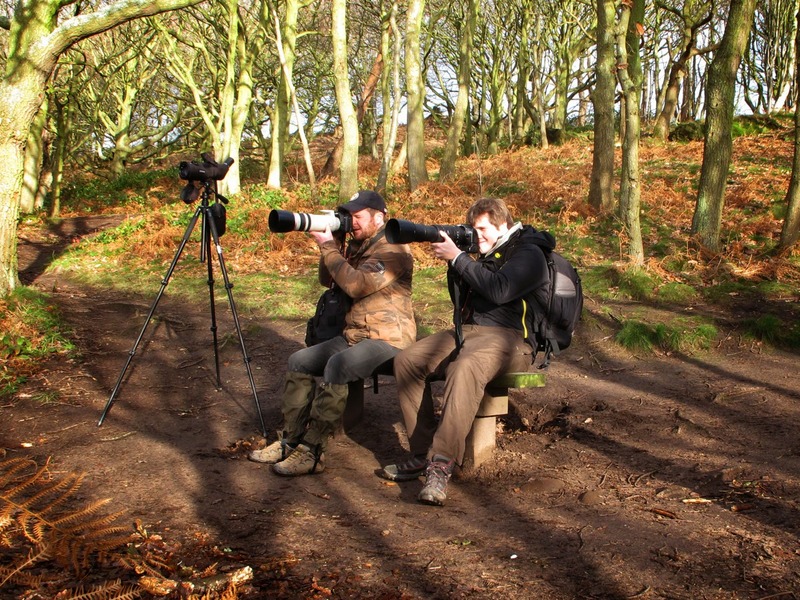 Thinking about it, the Festive Walk is just one of our normal walks with the addition of mince pies. Christmas jumpers must NOT be worn. Today is our Christmas “do”. However there will be none of the usual Christmas Do misdemeanours. Today nobody will get drunk and do something stupid in front of the boss, no one will fall asleep on the night bus and neither of us will wear novelty reindeer antlers. The weather is a bit sketchy, blustery freezing showers are being blown along on a keen wind and it is dark, really dark. Not an ideal day for wildlife photography but that doesn’t matter at all, today is more about just being out on the Patch and having a good, festive time. We tear off across the Patch like a couple of Christmas Bandits. Starting on the Wirral Way (where the Wood Pigeon Tree is reassuringly full of Wood Pigeons) we are greeted by hundreds of Thrushes. 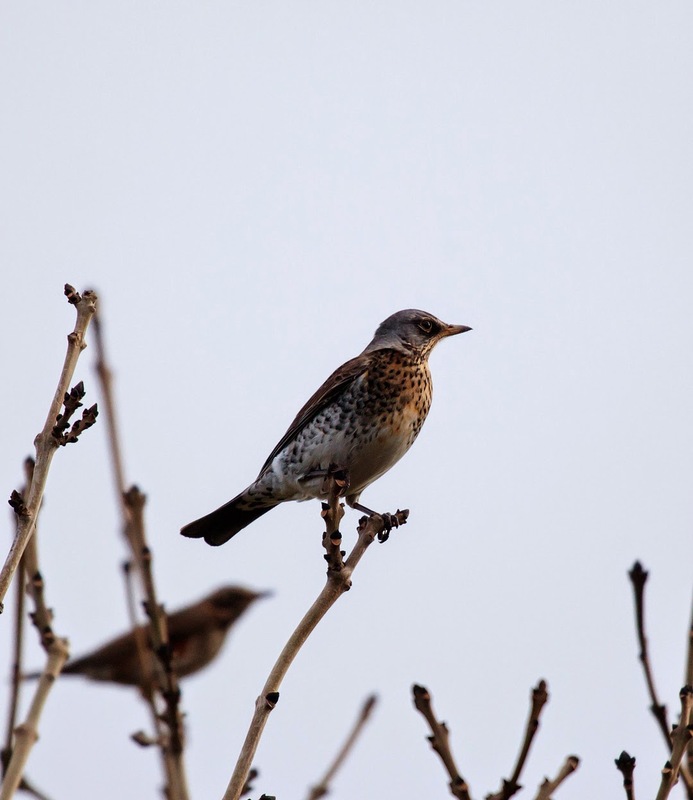 Redwings and Fieldfares dot the hedgerow like baubles on a Christmas tree. “tssseeeee” calls and angry “chack”s can be heard as they strip the branches of the ripe red berries. Loose flocks are almost always in the air, moving along the Wirral Way. We climb up to the Dungeon where we have our first food stop. One chicken tikka baguette, 3 cups hot apple, pear and cinnamon cordial, 2 mince pies and 2 apple & cranberry pies. We look for the Little Owl but it seems a Grey Squirrel has evicted it from its usual hole. We see Great Spotted Woodpecker and on the stream a Grey Wagtail is bobbing along. We try a selfie but it takes a couple of goes to figure out the self timer. The second attempt is more what we had in mind. 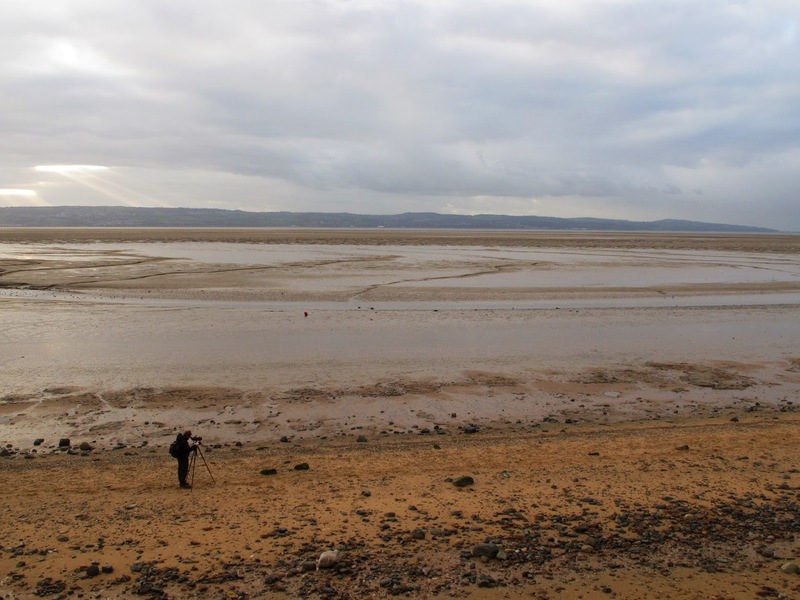 From the Dungeon we head to the shore via Heswall Fields. * Johnny’s wife has recently vetoed his attempt to purchase a set of night vision goggles. Shocking. We reach the shore and scan the estuary. We also polish off the rest of our supplies. 2 Plum, Pear and Cinnamon pies, 2 Rhubarb Pies and the rest of the cordial, hot from the thermos flask, cold from the hip flask. In Mono Valley some Teal are mooching around in the water and some on the muddy banks. As usual Oystercatchers are having a noisy dispute. Behind us a rainbow briefly brightens the sky over Oldfield Farm. The fleeting sunshine shows up a good roost of Knot straddling the gutter up by Thurstaston. We head in that direction as the rain sweeps over us again. By the time we get closer to the roosting Knot it has gone really dark again. For a moment it looks like the birds have fled with the passing shower but they are still there. Without the sun on them they fade into the muddy walls of the gutter. 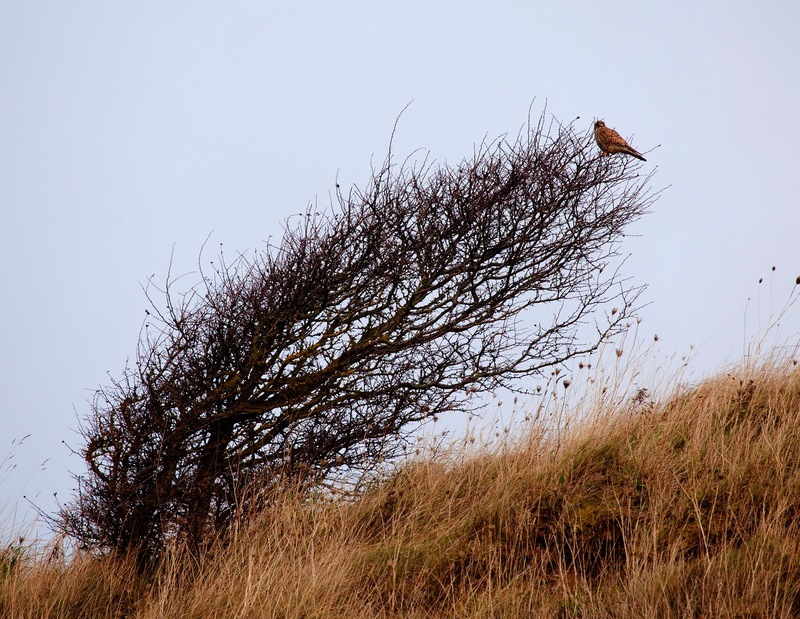 Above us a Kestrel sits in a gnarled old Hawthorn. The tree isn’t very tall and an odd shape due to its constant exposure to the prevailing wind. It seems defiant. I WILL grow here it is saying. We wait for the tide and in due course it starts to push the Knot from their resting place in Mono Valley out into the open. We watch for a while as they feed, squabble and squawk before flying down Mono towards the marsh. We are almost back at our origin but regular readers will know that we can’t finish yet. We need a picture of a Robin. Trouble is, they are being more than a little uncooperative today. I nearly had one at the Dungeon but it disappeared just as I hit the shutter. Back at our respective cars we wonder what to do about the Robin situation. It would be breaking our rules to go now, but it is nearly dark…. It is hard to even spot the birds. If only we had night vision goggles…. 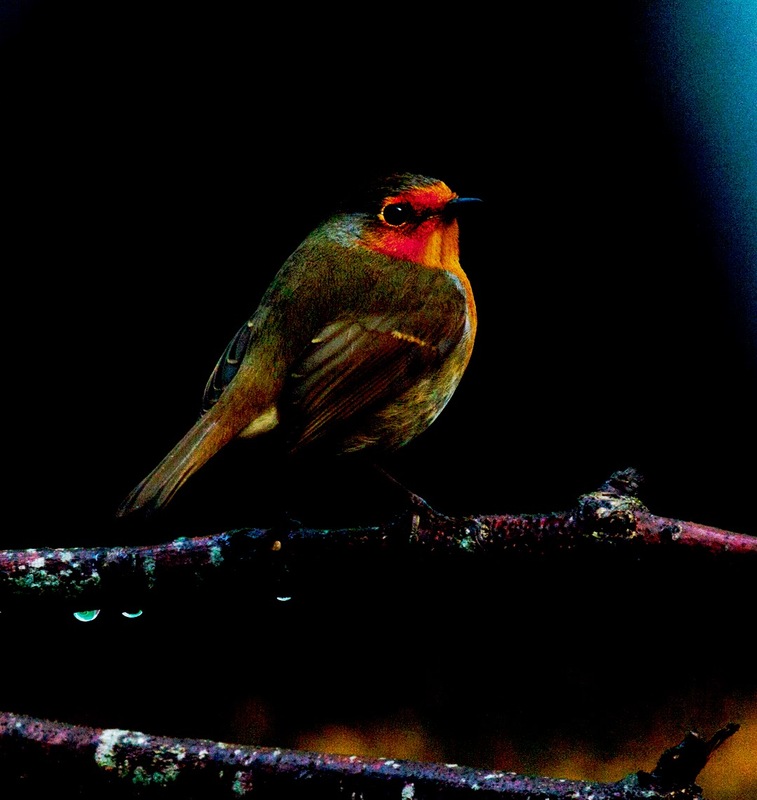 We stick around for a while and in near darkness a Robin finally turns up. It is photographed but I am almost ashamed to present it, but, rules are rules! So that is it for another year, our seasonal walk here is done. We can warm up, relax, stuff a turkey and focus on the festivities. And a Happy Christmas to you too! Your robin is much more colorful (even in the dark) than ours here in the U.S. although our robins are always a harbinger of spring and a welcome sight. Don't eat too much and have a drink for me!